For maximum comfort and greater heating convenience Ridea offers Round-to-bath, Ov-al bath and Cube al-bath towel warmers in electric versions with power ratings of 300/500/600 and 800W. The product includes an ONE electronic timer-thermostat designed by Selmo Elctronics in a Chrome finish and can be positioned on the right or left side of the product on request. The ONE fixed unit on the product communicates bi-directionally with the appropriate easily downloadable app for IOS and Android systems allowing a quick interaction with the installed towel warmer. Alternatively, you can request the accessory remote control in a chrome finish that can be hooked into a convenient visual area to the towel warmer elements using a magnetic support, or positioned with a special wall-mounting bracket. The complete kit will be supplied separately for quick installation. 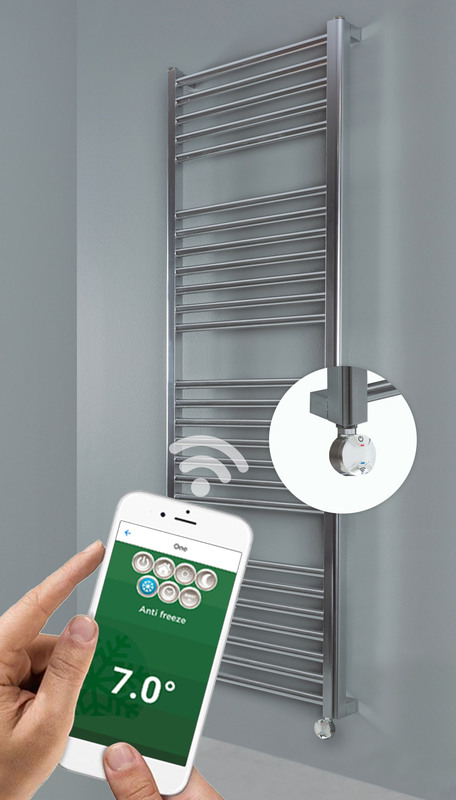 Through the special app or a single remote control it is possible to manage up to 8 different towel rails. Comfort, night, Fil-Pilote (thermostat connectable to the 6-way Fil-pilote control unit), Timer or Boost 2 hours, Stand-by, Chronothermostat, Antifreeze, ECO, open windows function, ASC, continuous heating control lock function which can be activated to avoid accidental changes to the settings. There are 6 preset and 3 programmable programs. Thanks to radial transfer: heat is emitted directly to people and the heat is “gently” granted to the surroundings thanks to inertia of the stone. A system that accumulates heat with extraordinary efficiency. Thanks to intelligent, simple and precise electronics, the electrical versions of the Greenstone range are capable of autonomously managing the power supplied based on the momentary thermal load of the premises so the temperature will always be ideal without wasting energy. The intelligent electronic control is in line with the prescriptions provided for in the EU Regulation 2015/1188 regarding environmental heating devices, which came into force on 1 January 2018. The Ridea range of electric towel rails by Al-tech meets the new ECO DESIGN directives, guaranteeing minimum energy efficiency values ​​thanks to the principles of eco-design. All our electric radiators are therefore characterized by high efficiency and maximum attention to energy saving.